* This is my article in BusinessWorld last Monday, May 21, 2018. The past three decades showed major disruptions in global politics and economics. These include the fall of European socialism with the collapse of the Berlin Wall in 1989, the creation of many new countries from the former USSR, the move towards freer trade with the creation of the World Trade Organization (WTO) in 1995, and the transition from heavy central planning to the market economy of two big socialist economies in the world, China and Vietnam. Disruption in macro economy and business is a result of endless innovation by new players both in business and politics. What used to be dirt-poor economies have transformed to middle-income, Internet-savvy ones. Let us review global economic performance over the past 25 years. We use 1992 as base year because there was no WTO at that time so many economies were still grappling with trade restrictions and by extension, investment constraints. The then top 10 East Asian economies are covered here (see table). These numbers show the following disruptions over the past quarter of a century. One, China’s communist central planning until the ’80s has resulted in a very poor economy. Its transition to some principles of the market economy resulted in massive turn-around towards more prosperity: GDP size has expanded 24x in current prices and nearly 16x in PPP values. Two, India has similar economic policies with China until the ’80s, very nationalistic, socialist, and restrictive. Its transition to some market reforms allowed it to expand its GDP size nearly 9x. 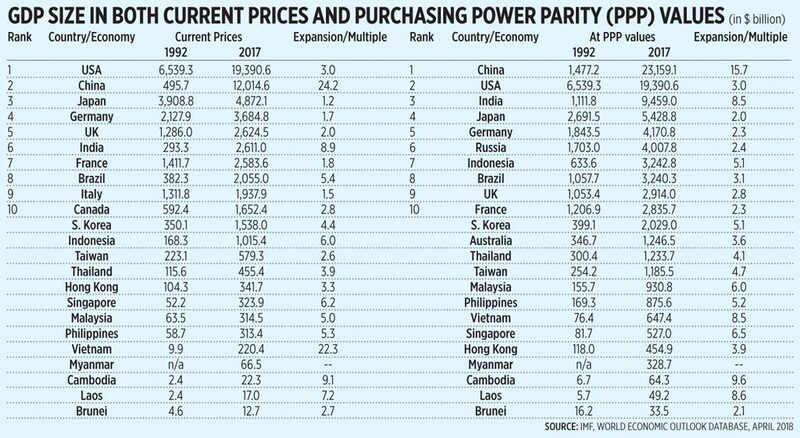 Three, seven to eight ASEAN economies have experienced GDP size expansion of at least 5x in just 25 years, whether in current prices or PPP values. Only Thailand and Brunei failed to expand 5x because they have a relatively high economic base in 1992 or earlier. Four, traditional rich economies of Europe, Japan, and US were only able to expand three times at most. This is because they already have a high economic base in 1992, and they have become more regulated and more bureaucratic recently owing to very high labor, energy, environment, and other standards. Going to the micro and enterprise level, many previously domestic and nation-limited companies in East Asia have become regional players and multinationals initially, then became global players. The Philippines for instance has produced a number of big regional players: San Miguel, SM, Jollibee, Unilab, Zuellig, Max’s, and Pilmico/Aboitiz. There are many new players that experienced disruptive ascent in just a few years of existence, like Udenna/Phoenix/Chelsea, Voyager, Mobext, AdoboMall. Their CEOs and presidents were among the speakers in the BusinessWorld Economic Forum 2018. Endless innovation has brought new players to the top and they are the disruptors of the corporate status quo. But their ascent to the top is not guaranteed because new breed of disruptors are being born and created every year. The market economy has an inherent disruptive, innovative, and subversive nature. Corporate expansion and bankruptcy, boom and bust, are 100% part of its DNA. This uncertainty and several other disruptions may be bad for existing players but they will always be good for consumers. Satisfying consumers is the single biggest challenge to all players, old and new. The Philippine and Asian governments should ride the wave of disruptions and allow more market reforms, more deregulation, de-bureaucratization and less taxation of the business environment. Governments’ goal of more welfare, less inflation to the people can be better provided by a competitive and dynamic economy. Plenty of private players can create more jobs and produce newer products and services at lesser cost, better quality, and more variety.